First, I have to thank you all for helping me out with my dying succulents! What great suggestions y'all had for me. I can't wait to get a few more and try again. 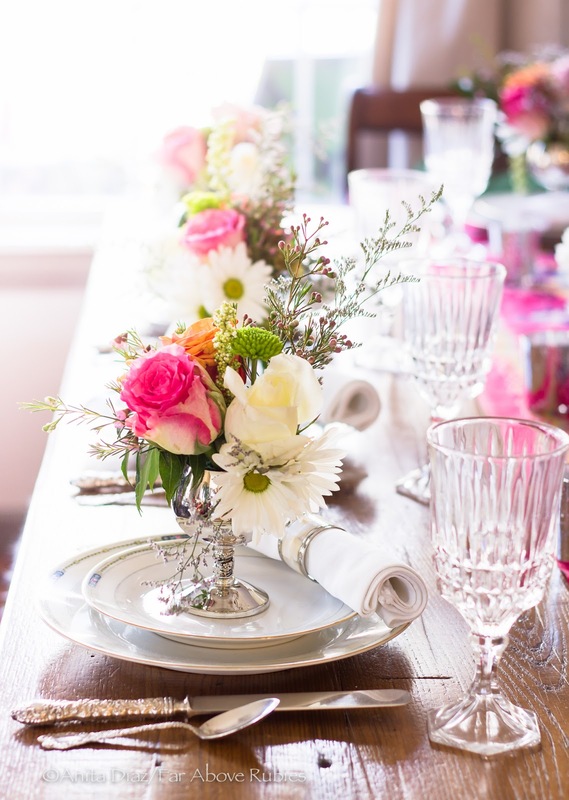 Now, on to this pretty spring table. After the Valentine's Dinner at Balsam Mountain Preserve, I had 16 flower arrangements to do something with, so they sat on my back porch all week. Luckily, it was cold, so they kept beautifully. I could not let them be wasted, so after sending a large arrangement to the owner and one to my mom, I rearranged a few of them and set a table in my dining room. I just love all these colors together, and they work perfectly in my room. I chose my favorite vintage Noritake pattern, Chandova, as I love the modern feel it has and the colors could not be more perfect. 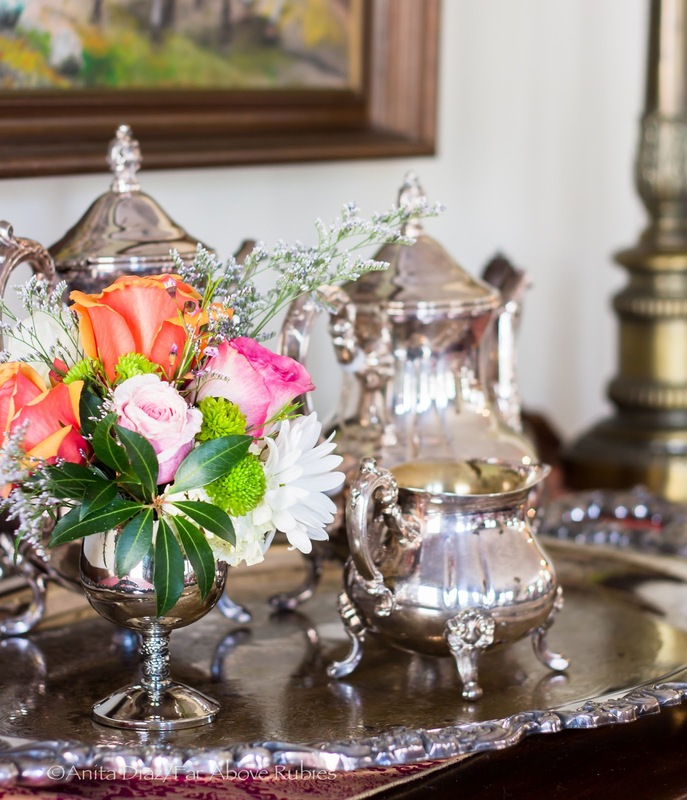 I left the arrangements in the silver punch cups and added some glass and more vintage silver. 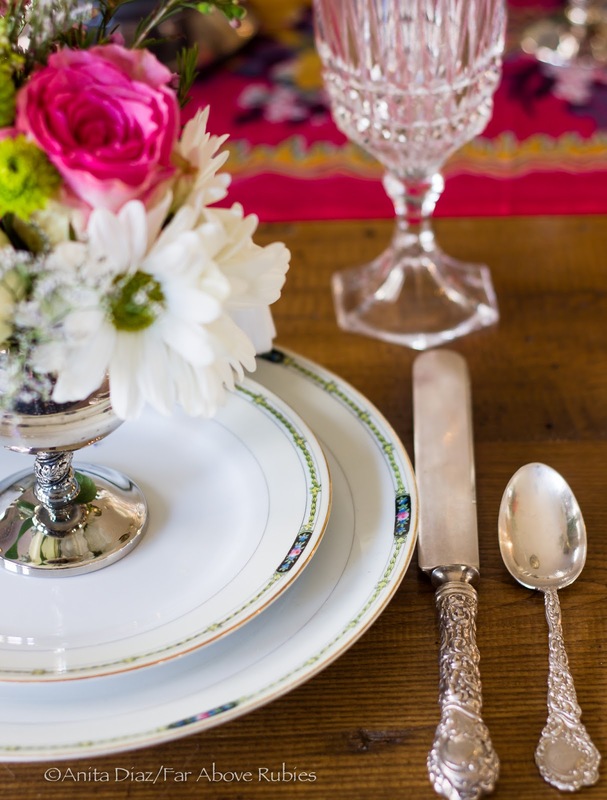 Vintage repoussé sterling silver flatware from 1893, Louvre, by Wallace and Sons, is perfect with the florals. 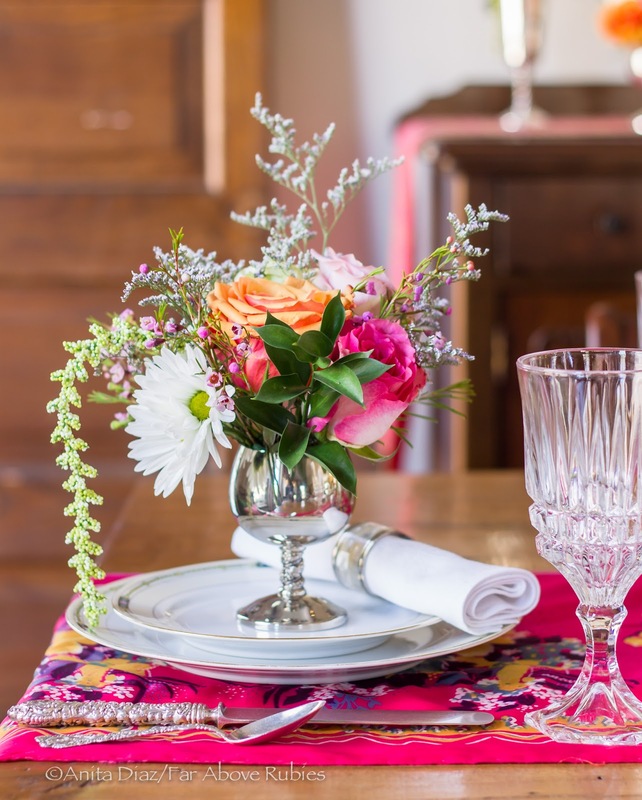 I have used these punch cups so much this way, and I love the special detail each arrangement adds to each place setting. They can be set above the plates while one is dining. 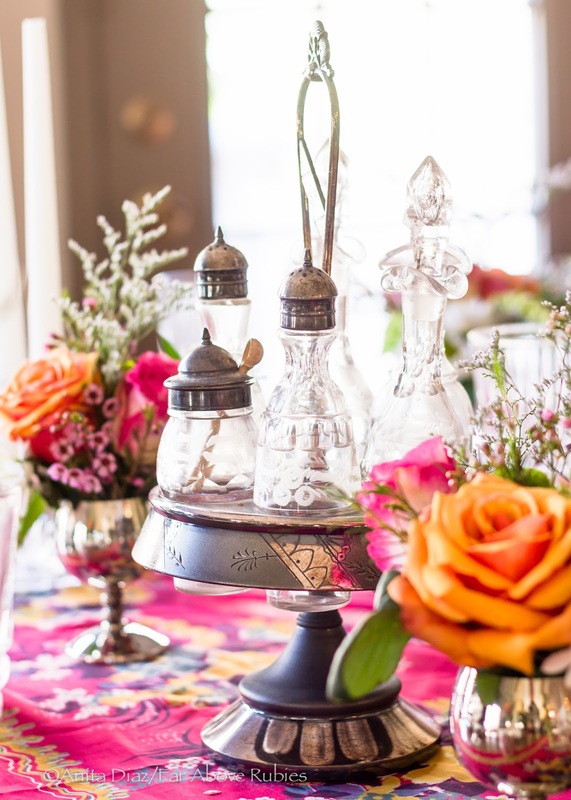 I used my great grandmother's cruet set for the centerpiece with two small flower arrangements and vintage Fostoria Baroque candlesticks. The runner is made from a vintage Indian sari in a floral print. The glassware is Fostoria Heritage. I was so excited to set this pretty table. 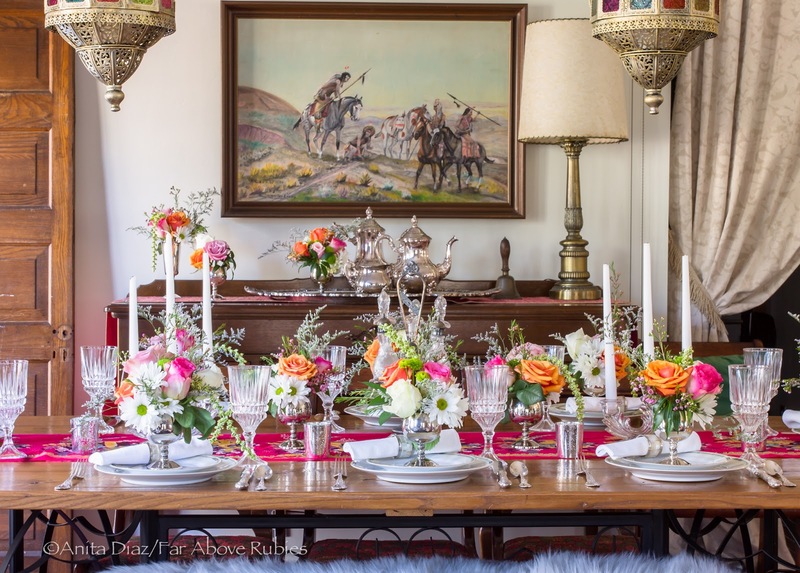 It would be so nice for a bridal shower, ladies' luncheon, or a high tea. In any case, the flowers make the difference. Wow that is such a pretty table! 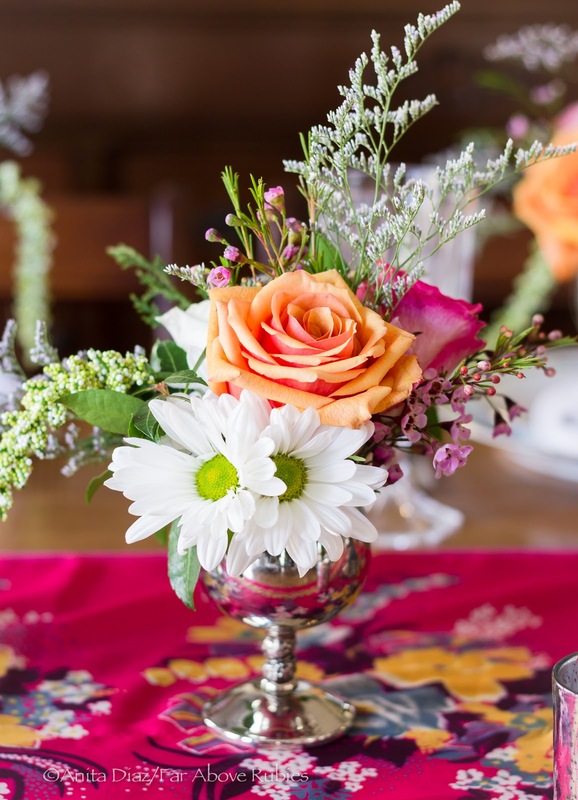 Your individual floral cups are sweet as can be. 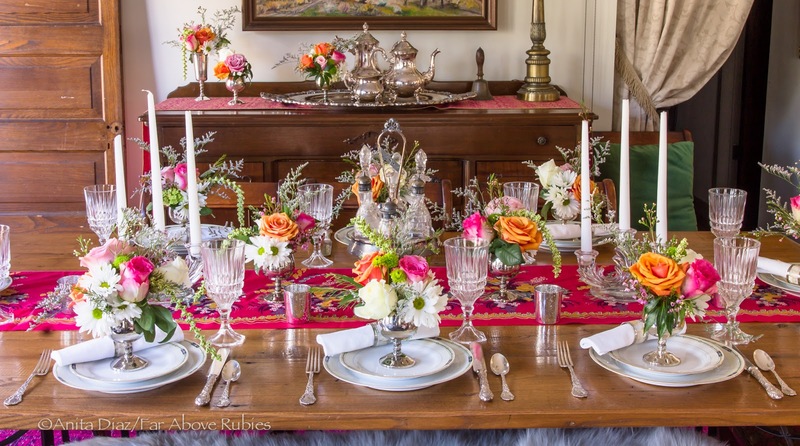 Love the overall colors in this tablescape. The crystal and silver add refinement and glam! This would be such a beautiful table for a shower! Pretty isn't the right word for this table. Exquisite fits it much better! 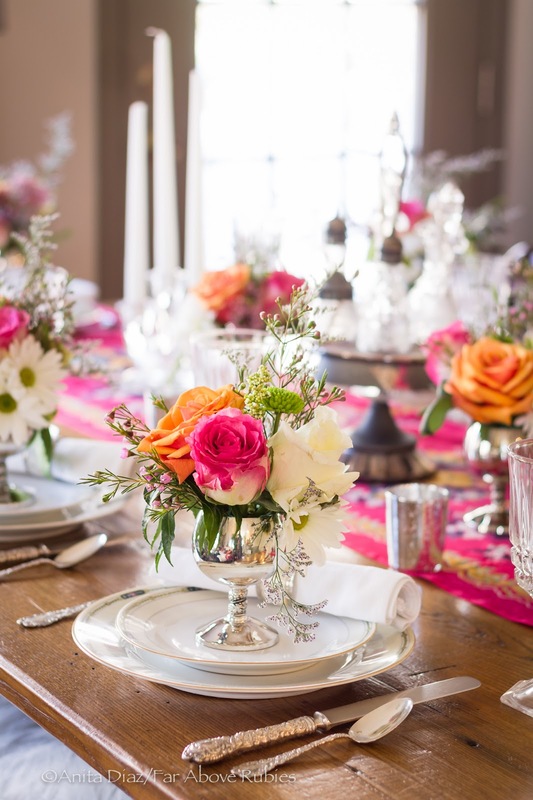 The saturated colors bring out the Spring and the dishes, elegance, very pretty! OMGoodness, this is gorgeous! 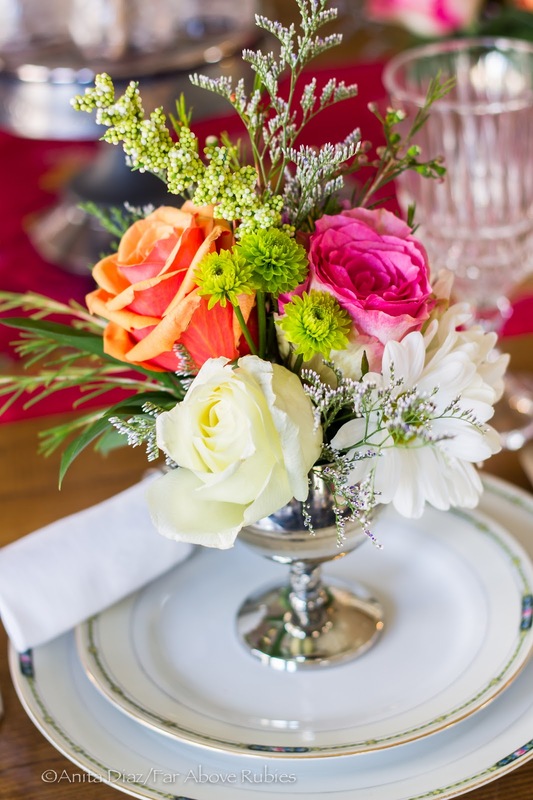 The flowers are just beautiful and I LOVE the punch cups!!! I wish I had some of those! I have never seen them with the stems!!! The silverware is spectacular as well. What a beautiful table, Anita! So pretty! I love the individual arrangments! Absolutely gorgeous! 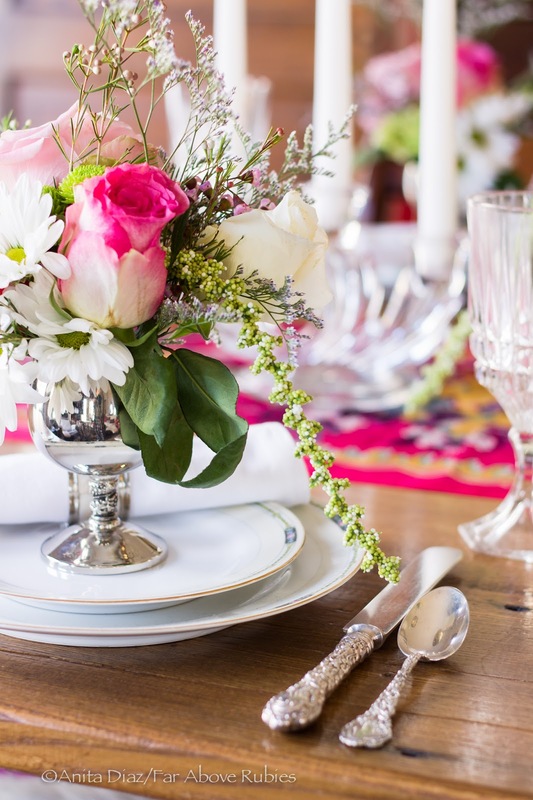 Love the flower colors, the china, flatware, everything is perfection! You are the Queen of tablescapes. So pretty. Looks like a party. I wish I could see more of the beautiful glass bottle with the stopper. Beautiful! You have such an extraordinary sense of color. 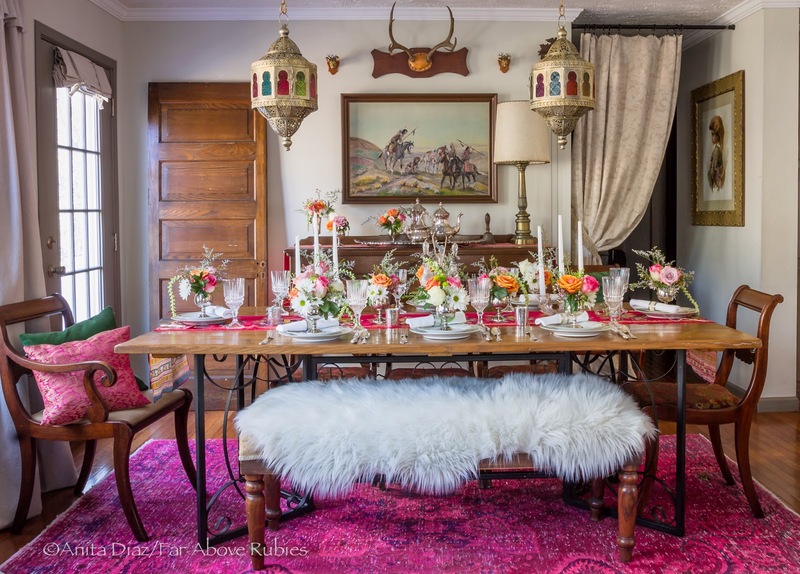 This is absolutely stunning-my first thought was that this table would be beautiful at a wedding shower or bridal luncheon! Gorgeous arranging!